Neil Young Promise Of The Real ‎– Paradox (Original Music From The Film). 3 Paradox Passage I 2:16. 5 Paradox Passage 2 1:23. 7 Paradox Passage 3 2:52. 12 Paradox Passage 4 0:13. Neil Young - Greatest Hits [CD DVD]. Title:Neil Young - Greatest Hits [CD DVD]. Artist:Neil Young. All of our paper waste is recycled within the UK and turned into corrugated cardboard. Your item will be previously owned but still in great condition. Item shown is the exact one you will receive direct from my personal well cared for collection. Factory pressed silver 2 disc set on the Crystal Cat label. Item is in excellent condition. Like New: "Dreamin' Man Live '92" by Neil Young (1CD, 2009, Reprise). Originally released on CD in 2009 by Reprise Records. Neil Young Promise of the Real - Paradox - New CD Album - Pre Order - Released 20th April 2018. All of our CD's are sent in Padded Envelopes or are Bubble-Wrapped! USED: We try our best to give an accurate account of any item that is being sold in used condition. NOT include. NO PICK-UP'S. Neil Young. Greatest hits (2004, CD/DVD). The Largest Collection in Germany. Second Hand and New. Here you may buy music at very low prices. Old Man [Live At Massey Hall 1971]. Helpless [Live At Massey Hall 1971]. Love In Mind [Live At Massey Hall 1971]. A Man Needs A Maid/Heart Of Gold Suite [Live At Massey Hall 1971]. Cowgirl In The Sand [Live At Massey Hall 1971]. Item shown is the exact one you will receive direct from my personal well cared for collection. Factory pressed silver disc set on the Firepower label. Excellent condition. Reprise for BMG Direct. 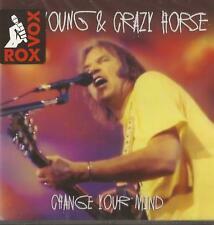 NEIL YOUNG AND CRAZY HORSE CD. CD and insert in very good to excellent condition. Item shown is the exact one you will receive direct from my personal well cared for collection. Factory pressed silver disc set on the legendary Gold Standard label. Item is in excellent condition. Two-CD collection of Neil Young and the Blue Notes live at various venues. Twenty-three songs included. UPC inked; otherwise mint. Sample And Hold. Hold On To Your Love. Computer Cowboy (AKA Syscrusher). Item shown is the exact one you will receive direct from my personal well cared for collection. Factory pressed silver disc set on the Musichein label. Item is in excellent condition. This CD is new, factory sealed, unplayed, original. We will resolve any issue! We are honest and friendly people. We want you to be 100% satisfied. 14 SEE THE SKY ABOUT TO RAIN. All other countries 3-4 weeks. Item shown is the exact one you will receive direct from my personal well cared for collection. Factory pressed silver disc set on the Red Phantom label. Item is in very nice condition. Release Year 2018. Record Label Reprise. Artist Neil Young. 2CD 1999 Japan heart breakers label. Neil Young - the Late Show in Boston (HB-945-1/2). live in Boston Music Hall, Massachusetts, Nov. 22, 1976. LIVE AT MASSEY HALL 1971. 3 Old Man Live At Massey Hall 1971. 5 Helpless Live At Massey Hall 1971. 6 Love In Mind Live At Massey Hall 1971. 8 Cowgirl In The Sand Live At Massey Hall 1971. NEIL YOUNG. Hier folgende CD / Here following CD Angry World. Peaceful Valley Boulevard. CD playing surface professionally cleaned using Optrix and de-static'd. Also included is a mini-review of this album by "GC" of the Absolute Sound. Mother Earth. People Want to Hear About Love. The Monsanto Years. After the Gold Rush. Human Highway. Neil Young ‎– Greatest Hits Live. Format: CD, Compilation. Rare Bootleg CD. 16 This Note's For You 3:49. 20 Philadelphia 3:01. Featuring – Pearl Jam. 19 Rockin In The Free World /. 18 Harvest Moon 2:25. Condition: S/sealed and new. i wish you can find the cds that you like, for your music collection. Neil Young - Unplugged CD. ▸ 4 Harvest Moon 5:03. Total length: 51:39. ▸ 10 Natural Beauty 10:22. ▸ 9 Dreamin' Man 4:36. ▸ 8 Old King 2:57. ▸ 7 Such a Woman 4:36. NEIL YOUNG - OFFICIAL RELEASE SERIES DISCS1-4 4 CD NEU. String Quartet From Whiskey Boot Hill. Hier folgende 4 CD / Here following 4 CD Only Love Can Break Your Heart. After The Gold Rush. Erscheinungsdatum / Release date: 05.10.2012. Item shown is the exact one you will receive direct from my personal well cared for collection. Item is in excellent condition.